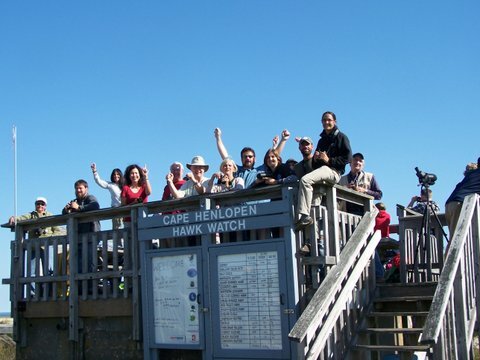 The Cape Henlopen Hawk Watch (CHHW) operation every spring (March 15 to May 10) and fall (September 1 to November 30). CHHW is organized under the Hawk Migration Association of North America. Volunteers, many of them members of the Sussex County Bird Club, count and report the numbers of passing raptors, including : Red-Tailed Hawks, Red Shouldered Hawks, Broad Winged Hawks, Cooper's Hawks, Sharp Shinned Hawks, Bald and Golden Eagles, Turkey Vultures, Black Vultures, Kestrels, Merlins, and Peregrine Falcons. Now and then something out of the ordinary may appear, such as a Mississippi Kite or a Swallow Tailed Kite. Please come to the Hawk Watch any day during the hours of operation. Experience is not necessary. 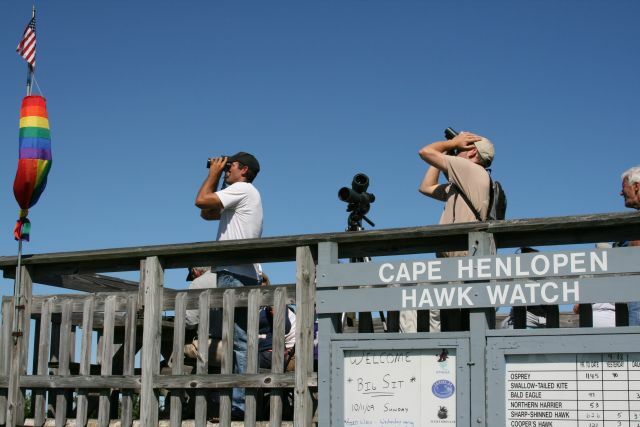 Veteran Hawk Watch members will answer any questions you may have, and provide training. There is always a need for an extra pair of eyes, if only to point out a bird and ask "What is that?" New volunteers are always welcome, so come and join the Hawk Watch for as little or as much time as you choose. You do not have to be a "birder" to participate, but you will leave being a birder for life! The Hawk Watch operates under a Fish & Wildlife grant that is contingent in part on the Hawk Watch’s ability to solicit volunteer hours. The Friends supports this group and a number of its members also volunteer their time at The Hawk Watch. We always looking for more people to come learn, enjoy and help. Birds of prey include a number of species and are frequently called "Raptors"
Raptors is Latin for "seize" or "take by force"